When the 83rd Legislature convenes this month, a “new look” Texas will face a legislative makeover. Business taxes, economic development, water, energy and transportation will be front and center, debated within the context of a state budget facing rising costs for Medicaid and deferred payments for education. While the budget provides the fiscal parameters, policy priorities will be driven by changing state demographics, rising population, and accompanying demands on our infrastructure. The composition of the Legislature will also be new. The Texas House of Representatives will include 67 first or second year members – almost half of the 150-member House – and six newly elected Texas Senators. With only 140 days to address big issues that will impact the state for many years to come, those members will face a learning curve that could impact the flow of legislation. A constant over the past decade is that the state of the Texas economy is relatively strong. Sales tax collections are exceeding projections and we gain 1,000 new residents every day (and seemingly as many new companies). Multiple publications call Texas the best place in America for business and we remain a place where entrepreneurs can innovate and small business can thrive with comparatively low taxes and a stable regulatory environment. The margins tax, which replaced the prior franchise tax of 4.5 percent on earned surplus with a broader one percent tax on total revenue, was created in 2006 after the Texas Supreme Court ordered the Legislature to find a source for education funding to augment reliance on property taxes. Critics say the new tax has resulted in significantly higher taxes for many businesses and compliance is costly and complicated. To address concerns of small business in particular, in 2011 Governor Rick Perry signed into law an exemption to the margins tax for companies with annual revenues under $1 million, an exemption set to expire in 2014. While many options are being considered, a move to simplify the tax and make the levy more equitable across the board will be the primary goals. Economic development incentives and their return on investment for Texas will also be hotly debated. The Select Committee on Economic Development will make recommendations to the Legislature on the value of programs like the Texas Enterprise Fund, the Emerging Technology Fund, the Texas Economic Development Act, and a myriad of incentives and credits across all business sectors. With Texas competing aggressively for jobs and corporate re-locations with other states and even countries – particularly the BRIC nations of Brazil, Russia, India, and China – many believe there is a role for the public sector to catalyze private investment, particularly when most of the venture capital still resides on the coasts. In fact the Wall Street Journal’s “Top 50 venture-backed firms” of 2012 included but one Texas company (but a very big one, in fact #1Genband from Frisco) and was largely otherwise populated by companies in Silicon Valley and on the east coast. Proponents contend that access to capital is the lifeblood that sustains many small businesses and is critical to making sure Texas entrepreneurs have the opportunity to create the next great company, and keep its jobs in Texas. Many Texas CEO’s consider education and workforce skills training critical to staying economically competitive and attracting company re-locations and their jobs. The Kauffman Foundation ranks Texas 41st for the education level of its workforce and 34th in expenditures per student. Whether (and how) to increase funding for public education so that Texas develops the workforce of the future will be debated along with the role of standardized testing, school choice for parents, and the means by which the state finances our public schools. In terms of higher education, the Chancellors of Texas’ five major university systems recently testified that the state should, at a minimum, restore higher education funding by the $1 billion cut during the 2011 session. The Chancellors argue that innovation and emerging small companies are spawned by the research done on our leading campuses, and serve to attract capital and jobs. The Governor has challenged our institutions of higher education to make undergraduate degrees available for $ 10,000, and in December announced a targeted workforce skills initiative that will connect Texas Workforce Commission programs directly with our college campuses to equip our college graduates with the skills to fill available jobs in high-growth sectors. Texas has become a destination state but keeping up with population growth requires infrastructure, from water to electricity to roads. The state water plan allows for public-private development of pipelines to get water where it needs to go, but hasn’t been funded. The state’s Public Utility Commission is considering the merits of an electric market design to prepare Texas for growth-driven energy demand over the next several decades. Similarly, the state has to decide if the recent trend toward public-private partnerships to build toll-based highways makes the most sense for the state’s transportation requirements. Funding for water and roads and consideration of our energy needs over the long-term, including the use of renewable sources like wind and solar, will get considerable attention. 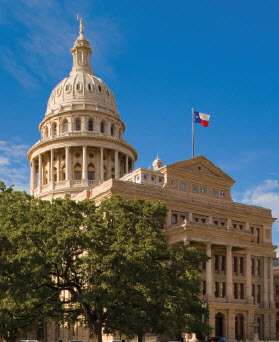 The 2013 legislative session presents challenges for Texas business and its citizens, and also opportunity for good public policy with an eye on the future. If state leaders, stakeholders, and an engaged public can address and find solutions to the big issues based largely around infrastructure in all forms – the state budget, the corporate tax structure, education and workforce excellence, and funding for energy, transportation and water – Texas is positioned for a new look that will stand the test of time over the next decade and beyond.